Peg Leg wrote: How do the WRu make more than us? Surely the provinces feed into the Irfu books no? Grand, but do the IRFU not receive revenue from the p14 & HEC wins, the qtr final of the HEC & the final of the p14? Do the IRFU not receive money for gigs in D'Viva? How much is the prize and sponsor pay out for all of the above & a grand slam? Like Wales are shite like, ...? The WRU have more events and play more matches and own their own stadium. 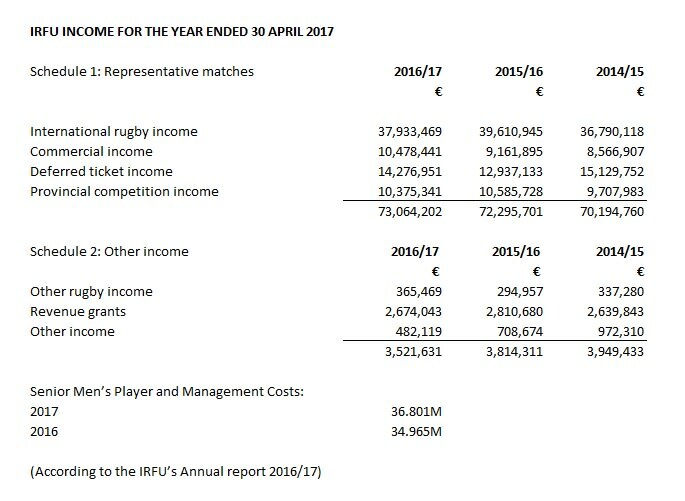 More matches and more events means they've also higher expenses than the IRFU but it's still obviously good for them that they are making more profit. Still, they do seem to be desperate to play as many matches as possible. I'd say the IRFU are doing alright. They raised €70m in 2010 selling 5,000 10 year premium tickets. That went to clear the stadium debt. In 2020 those tickets will be freed up. I'm not an expert on it so feel free to correct me. Millenium Stadium Cardiff: Capacity 74,500; exclusively owned by WRU. Social / Planning limitations on use of Aviva Stadium. Prize money for National & Provincial wins are offset by Success Bonuses for Squad and Management. Stadium capacity and usage is the core factor in comparative income profiles. Leinster got E300K for reaching the Heino semi and E600K for winning the final. The IRFU took the money and used it to fund Carberry's new munster contract. Peg Leg wrote: Grand, but do the IRFU not receive revenue from the p14 & HEC wins, the qtr final of the HEC & the final of the p14? Yeah they do but so do the WRU. They actually get all the revenue from Judgement day as well and distribute a fee to the teams. It's actually a money spinner for them. So technically they (leaving out the minnow AI for both) have two more games than the IRFU. If You check the accounts the big difference is the 8-9m they make in hospitality from match day income and events. Aviva is a stadium company and doesn't host as many events. The prize and sponsor payout is a bit of a double edged sword because the players have to get paid as well. You can probably hedge it but if you've won it twice and the lowest you've finished in the last 5 years is third that aint gonna be cheap. 16/17 we both had 2 home games but IIRC we got an extra 1.5m for the All Blacks game. England prop Joe Marler is set to announce his retirement from international rugby at the age of 28 for personal reasons. The Harlequins player has won 59 England caps since making his debut in 2012 and toured New Zealand in 2017 with the British and Irish Lions. He withdrew from head coach Eddie Jones' latest England squad on Sunday. England face South Africa, New Zealand, Japan and Australia in the November autumn internationals. Marler will continue to play for Harlequins and is available for the Premiership match at Gloucester on Saturday. World Cup - The TV rights jackpot? WORLD CUP - This week in Sydney, while the World League project has met a real consensus among the major nations of the sport, it is especially the prospect of pocketing additional TV rights that could allow it to see the day from the 2020 season. One more step towards the World League! The World Rugby Steering Committee met in Sydney all week long to think about " exploring competition models in accordance with the principles agreed in San Francisco to give more weight to the international windows of July and November, " the statement said. first information. The international federation decided not to touch the international periods whereas in the project of World League defended by Agustin Pichot , the niche of the summer no longer existed. By November and a future meeting planned in Dublin on the subject, the project's " task force" has been asked to focus on a competition played in two stages instead of test-matches. With the start of the qualifying phase taking place in the Southern Hemisphere in July and the semi-finals and final and classification matches in November in the Northern Hemisphere. The principle of a unity of place for the three knockout matches is retained. For the first year in 2020, the first two of the 6 Nations and those of the Rugby Championship would compete for the first trophy while the other countries ranked three to six in the Tournament and two of the Four Nations plus Japan and the United States. United would compete to determine a ranking. The twelfth would then be relegated to the second division of World League. If the format is yet to be refined economically, the project is moving forward more quickly. World Rugby had asked a TV rights agency to estimate a possible price for such a competition. The agency, after an audit, advocated a global pooling of rights to broadcast international games outside the World Cup. According to her, if all countries and competitions put their rights in common (including that of 6 Nations and Rugby Championship), World Rugby could hope to sell a total of between 800 million and a billion! 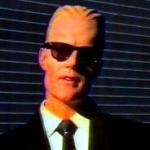 This would allow nations to get a real bonus over what they currently perceive. Thus Argentina receives only 8 million euros when the other nations of the South receive 24 million a year, France a little more than 30 million euros. The World League should therefore allow the International Rugby Federation to see its revenues increase. It is also a condition sine qua non for it to emerge. Rugby union is poised for its most radical change since it became a professional sport as it prepares for the launch of the most significant global competition since the World Cup was first played in 1987. World Rugby, the governing body led by chairman Bill Beaumont, has approved a new inter-hemisphere competition that would take place in the autumn and spring Test windows in November and July. It could begin as soon as 2020 if sponsors, broadcasters and other commercial backers can be found quickly enough. Several formats have been suggested but The Sunday Times understands that the most popular is a 12-team competition that would be split into two divisions. There would be six teams from each hemisphere — England, France, Ireland, Italy, Scotland and Wales from the north, and South Africa, Australia, Argentina and New Zealand from the south, plus most likely Japan and Fiji. There would also be a second division, with promotion and relegation between the top flight, a significant move that would give Tier 2 nations the chance to burst on to the world stage. Tier 1 teams would have to play away in Tier 2 territories in league play, something they have so rarely done. The second flight would include the likes of Georgia, Romania, Spain, United States, Russia, Tonga and Samoa, with China and Germany contending because of the attraction of their powerhouse economies. Matches would be played in the autumn and spring, with European teams playing southern hemisphere opponents in the regular season. There would be semi-finals and a grand final. The tournament would probably take place annually for three years, leaving the fourth clear for the World Cup. There is another option in which each tournament would last for three years. The competition would put an end to tours by individual countries, though the Lions concept would remain sacrosanct. Significantly, it is not clear if the new competition would lead to a reduction in the number of Tests matches — something senior World Rugby figures such as Brett Gosper and Gus Pichot, chief executive and vice-chairman respectively, plus the players’ unions, have called for. The decades-long suppression of smaller rugby nations would become a thing of the past. Final agreement on the outline plans was given by all nations at what was described by delegates in Sydney last week as a “harmonious” gathering — another first for the world game. Devalued along with the world cup. I'm not sure what to make of it. It's certainly southern hemisphere led and will give them a massive boost. That's why they want to package it. Marler now says that he deliberately pick up Yellow and Red cards for his club so as to miss England games in the past. Well that was a disappointing return. As much as I respect the job he did and the stance he held in not opening the 6N up to other countries I don't like Feehan at all so delighted he's gone.